C-Pen 800C offers new and enhanced features marking a significant upgrade from both the C-Pen 200 and 600C. They include: C Schedule, an MS Outlook-compatible calendar; an auto-trigger text scanner; a built-in rechargeable Lithium battery; alarm function; expanded storage for up to 2,000 pages of printed text and 1,000 addresses, plus a sharper six-line display in a signature metallic silver pen-shaped device. C-Pen 800C's C Message feature utilizes GSM phones including the Ericsson 888 and the Nokia 9110 Communicator via IrDA. The C-Pen can detect when it is placed over text and will automatically activate the scanning light. An alarm can be set to remind you of all those important meetings. A fully functional digital camera facilitates the reading of text at a rate of up to 100 characters per second. These images are translated into text via sophisticated OCR software before being processed and stored in the C Pen's sophisticated flash memory. C Pen has 6 Mb of flash memory which means that up to 2000 pages of text can be stored direct in the C Pen. C Address is a fully functional contacts manager that interfaces directly with Microsoft outlook. Contacts can be scanned direct into C Contact via a well designed interface. Up to 1000 contacts can be stored in Microsoft Outlook. Contacts can be synchronized between the C Pen and Microsoft Outlook. Us the C Pen in much the same way as an ordinary pen to "write" files direct into a computer text format. This function will ensure easy file lookup and fast entry of words to be translated. C Dictionary is an additional software package that can be downloaded from C Technologies web site ( www.cdictionary.com ) Each software package contains a full sized two way Oxford or Norstendts dictionary text. 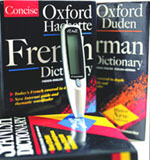 The C-Pen 600 is offered with one free Language translation dictionary. Italian, Norwegian, Portugese, Spanish, Swedish. Now supports Macintosh. Go to http://www.cpen.com/mac/ for more information.